This page covers several activities that fall under the umbrella of our Pre-College STEM Outreach program. Discussed below are Engineer's Week, our Great Paper Airplane Contest, Yuri's Night, our Scholarship Program, the Section's Space Program, and the always-fun Water Rocket Launches. If you would like to be involved in any of these programs, or if you have any questions or comments about them, please contact our Pre-College Director at ragini.acharya@cfdrc.com. Celebrate Engineer’s Week (E-Week) with us! 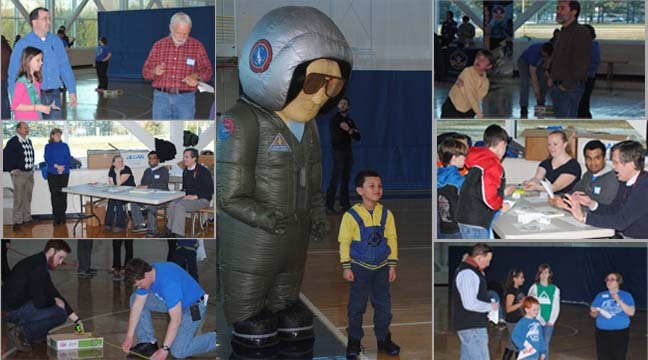 Always held as an annual event during the week in February that encompasses George Washington’s birthday, AIAA organizes events to encourage engineering throughout the week that include activities for students in K-12. 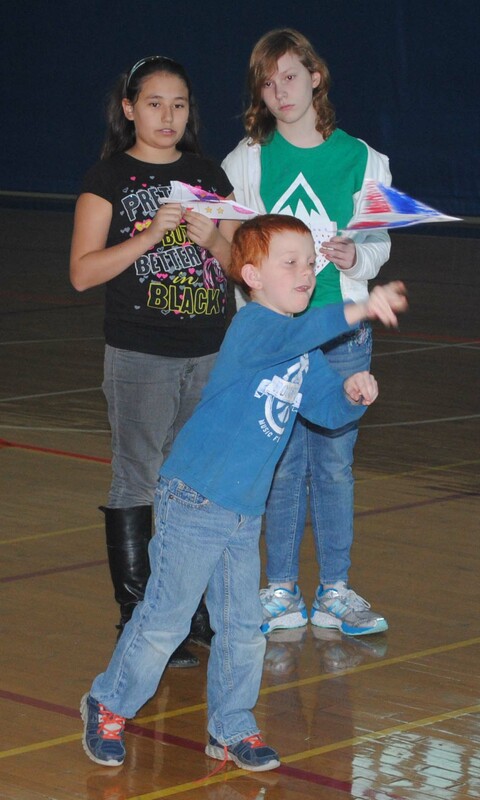 Typically, our Great Paper Airplane Contest is held during E-Week. Each year the AIAA Student Branch at the University of Alabama in Huntsville cosponsors with the Greater Huntsville Section an Annual Great Paper Airplane Contest. Recently, the annual contest has been held at the UAH University Center Exhibit Hall. Approximately 100 contestants of all ages typically participate. There are five competition categories: time of flight, aerobatic, distance, accuracy, and artistic, with five different age groups. Prizes are awarded to the 1st, 2nd, and 3rd place winners in each of the age groups. Also, each contestant receives an official contest t-shirt. Join us for our extremely popular annual Paper Airplane Contest, typically held the Friday of E-Week. AIAA participates in the family portion of Yuri’s Night Huntsville, held on or around the anniversary of Yuri Gagarin’s historic flight, by teaching kids (and their parents!) who visit our table about human spaceflight, handing out space themed goodies, assisting the kids in donning helmets and spacesuits, and acting as the launch pad for a plethora of stomp rockets flying throughout the Davidson Center. 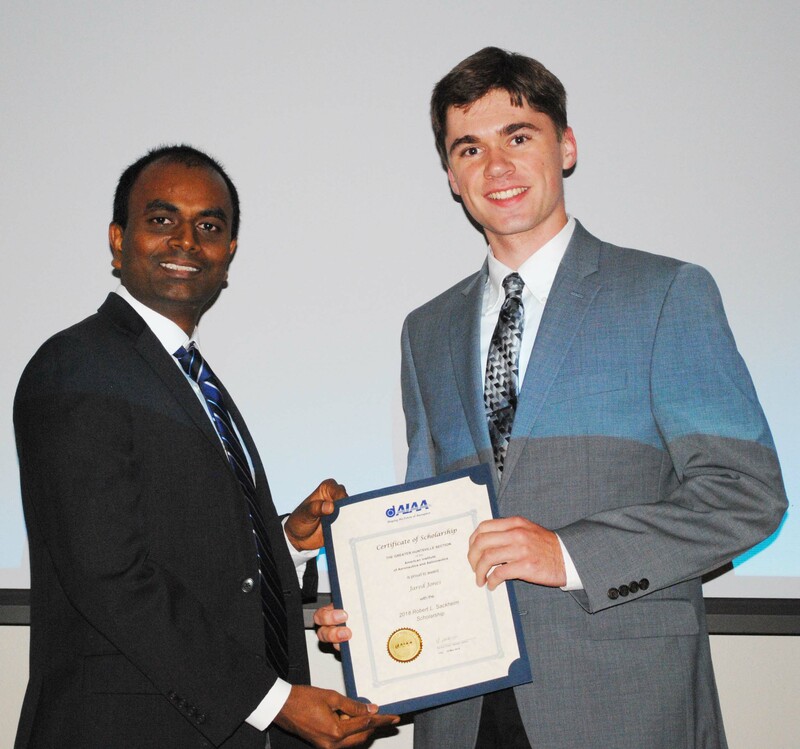 The Annual AIAA Greater Huntsville Section Engineering Scholarships have been awarded since 2002. The scholarships are intended to promote careers in the aerospace industry by encouraging students to pursue related engineering or science degrees. The scholarship is given in memory of Bob Sackheim, a former AIAA Greater Huntsville Section Chair and a strong advocate of education. Scholarship information and applications are posted early-to-mid-Spring, and applications are due by April 30. To be eligible, a candidate must be a high school senior living within the Greater Huntsville section area, entering an accredited university in the Greater Huntsville Section area, and pursuing an engineering or science degree that would reasonably lead to a career in aeronautics or astronautics. The scholarships have been funded by contributions and by the proceeds of seminars and symposia that the Section has sponsored or cosponsored, and an endowment has been established to aid in supporting these scholarships. A brand new collaborative program within the Greater Huntsville Section, the Greater Huntsville Section Space Program includes two projects – Kids in Space and High School to Orbit. Our Kids in Space project is geared towards getting smaller experiments from the K-12 communities flown to the edge of space in a pongsat. Anything from marshmallows to computers can be flown in the pongsat. The Greater Huntsville Section’s goal is to work with schools towards a goal of 300-500 pongsats launched each year. Our High School to Orbit project focuses on AIAA members working with and mentoring a team of 5-6 high school students on their path to designing a cubesat that will be launched and returned to the team for review. The Greater Huntsville Section’s goal is to work with 2-3 teams each year. Watch the AIAA site for more information about the Greater Huntsville Section Space Program and about how to get involved! Help us design a fun summer activity for the kids during summer! We know that water and summer have always gone together. What if we mix rockets in with that? Stay tuned as we develop plans for our summer water rocket launch!